VF Corp.’s quarterly beat, aided by a sales increase in China, is fueling a rally in branded apparel peers that include Canada Goose Holdings Inc., where concerns of a slowdown in the region has weighed on the stock. China sales increased 23 per cent year-over-year on a constant currency basis at VF Corp. During the conference call, executives said China is a " strategic investment priority" that’s paying off. Finance chief Scott Roe said the company saw "pretty meaningful acceleration in our China business this year," which gives management confidence in its outlook for the region. The company is monitoring China and other markets closely and maintains that the overall consumer backdrop remains solid. "As it relates to trade, the impact-to-date has been de minimis," Chief Executive Officer Steve Rendle said during the call. The retailer’s shares climbed more than 15 per cent, the most intraday since March 2000. Results were also helped by brands North Face and Vans, which produced quarterly sales that topped analysts’ estimates. VF shares are the top performer in the S&P 1500 Textile & Apparel Index (S15TEXA), which rose 3.6 per cent, the highest in more than six weeks. Other notable index gainers include Hanesbrands Inc., Carter’s Inc., Ralph Lauren Corp. and PVH Corp.
VF’s ability to marry innovative products with the right marketing and sales channels in China “is creating a flywheel effect on growth,” said Camilo Lyon, an analyst at Canaccord Genuity. In addition, its brands are newer to Chinese consumers, meaning that the market opportunity remains very robust, he added. As trade tensions ease, gains are expected to continue in the region, according to John Staszak of Argus Research. 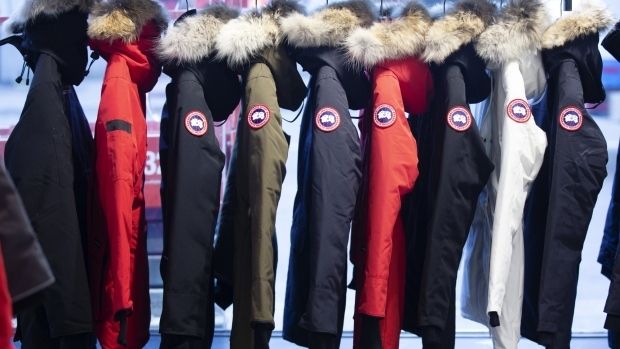 Shares of Canada Goose, which had been under pressure recently amid political tensions between China and Canada, climbed as much as 5.1 per cent. The Toronto-based retailer is expected to report results early next month, according to Bloomberg data.